Weighing as little as 46 grams with a body length of just ten centimeters, Demidoff’s dwarf galago is the smallest primate found in Africa. Their small size means they are able to reside in dense rainforest foliage that larger primates would have difficulty moving through. All galagos are nocturnal and to see at night they have huge eyes which they use to navigate through dense vegetation to find food. Their diet varies depending on the season, but they mostly feed on insects, tree sap and fruit. Their ears can move independently of one another, to help them detect noises made by insect prey. Their specially enlarged front teeth scrape wood and bark from trees to obtain gum and sap, which make up three-quarters of their diet. Demidoff’s dwarf galago is capable of an impressive 1000 “gum scrapes” per night. All galagos have a handy upward facing claw for scratching and combing their fur. Galagos are vertical climbers and leapers. They have longer and more muscular hind legs than forelegs, which helps them to take large leaps between trees in forests. When leaping from tree to tree they use their long tail for balance and large grasping hands for a secure landing. As they use thin and unstable branches to move, the equilibrium provided by their tail and long limbs are highly important. 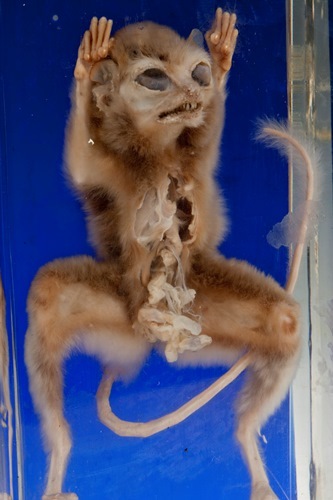 These features typify prosimians, the more “primitive” sub-order of the primates to which the galagos belong. Perhaps then the comical position of this specimen actually provides the viewer with a relatively accurate snapshot of an oncoming galago in flight. Demidoff’s dwarf galago often washes its hands and feet with urine which is used to leave scent trails around their territory. It is further thought that by placing urine on their feet, they may improve their grip which is highly important in view of their arboreal lifestyle. 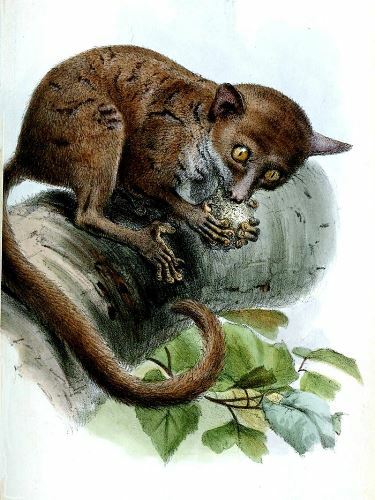 Although Demidoff’s dwarf galago is not currently considered endangered, their numbers are thought to be declining primarily due to widespread deforestation. 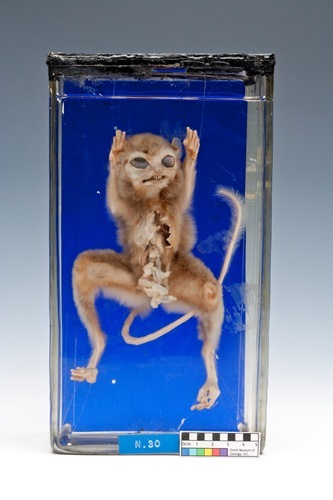 George Phillips is Museum Assistant at the Grant Museum of Zoology.